What does ‘reporting your premiums’ mean? When we say you must report your premiums, what we mean is, you have to tell us your payroll information. You are responsible for telling us the total of all insurable gross earnings. For details, see calculating your premiums for step by step instructions. How do I report my premiums? Enter your insurable earnings and your premiums will be automatically calculated and submitted for you. See calculating your premiums for more information on determining your insurable earnings. How much will I pay in WSIB premiums? Your premium payments are based on the health and safety risk of your business activities, the size of your payroll, and on your company's health and safety record. See more on premium rates. The better your company’s health and safety record, the less it costs the insurance system. For this reason, the WSIB supports financial incentive programs that reward employers for good health and safety practices. Check out our prevention programs and incentives to find out which programs apply to you. You can also work with your peers to encourage industry-wide best practices for workplace health and safety, to lower the collective costs to the system by your rate group. What can I do to help lower my rate group’s premium rate? You can help lower your class premium rate by making your workplace safer and developing an early and safe return-to-work program. We offer a variety of voluntary programs to help eligible businesses improve workplace health and safety. See information about our Health and safety services. You can also, share your workplace health and safety knowledge and experience with other members of your rate group. If you suspect that a business in your rate group is getting an unfair financial advantage by not registering with the WSIB, not reporting injuries or illnesses or not paying premiums, contact our toll-free action line at 1-888-SI-LEADS (1-888-745-3237) 730 a.m. to 5 p.m., Monday to Friday. *Please note that providing information via email does not guarantee protection of your identity. When do I need to file a year-end reconciliation? Filing a reconciliation form ensures that you have reported and paid all your premiums. It also confirms the accuracy of the payroll information you used to calculate the premiums. For instructions on completing the form, see completing the reconciliation form. Can I report and pay my premiums on my mobile device? Yes, you can access the full desktop ePremium site on your mobile device. You can also pay by credit card (Visa or MasterCard), Visa Debit or Debit MasterCard, or Interac Online. How do I sign up and log into ePremium? If you haven’t signed up for ePremium, sign up see what information you’ll need below and sign up now. What do I need to sign up for ePremium? Your WSIB firm or account number. In most cases, you’ll need the amount of the most recent payment you made to the WSIB. If you’re the first person from your organization to sign up, or haven’t made a premium payment to the WSIB before, you will also need your Canada Revenue Agency Business Number, as well as details of at least one of the rate groups under which your business is classified. If you are signing up multiple accounts for ePremium, please wait for our confirmation email before enrolling another account. You will then be able to access ePremium using the website link provided in the email. Please note, if you registered for ePremium today, you can start using it tomorrow. 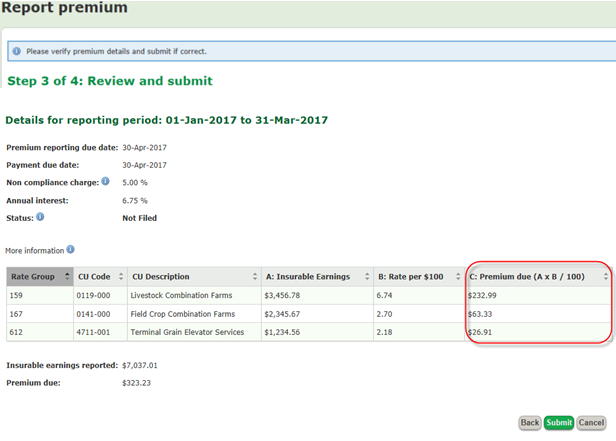 If you have only one account setup with ePremium, the first screen you will see is the Report Premium - Step 1 of 4: Select a reporting period page. Notice the Tools menu on your left where you can navigate to other ePremium features, like reporting history and online submission history. If you have more than one account setup with ePremium, the first screen you will see when you launch ePremium is a list of all the accounts that you can select from. Click on the legal/ trade name for the account you wish to report a premium for. You will be taken to the Report Premium - Step 1 of 4: Select a reporting period page. Step 1 of 4: The page will list any reporting periods that have not been submitted yet. Each reporting period is a link. Click the reporting period you would like to report. If there is more than one account, select ‘Switch account’ to view another account. If you have more than one rate group / classification unit code, they will all be displayed on one page in table format. Click Calculate Premium. Your classification unit (CU) premium is calculated for you in column C: CU Premium (Column A x Column B / 100). If you are ready to submit this amount, click ‘submit’. A dialog box appears prompting you to confirm whether you would like to proceed. Tip: Depending on your computer settings, the pop-up box may not be visible. Try scrolling up - you should be able to see the pop-up box. The detail of your premium submission including information such as the date and time a premium was submitted and by whom the premium was submitted appears. Select your financial institution from the drop down list near the bottom of the page. The website for the financial institution appears. You can make your payment online if you have an online banking account. Tip: To pay WSIB through your online banking account, you will need to add WSIB as a payee with your financial institution. WSIB is normally listed as Workplace Safety and Insurance Board of Ontario - Schedule 1 or WSIB Ontario Schedule 1. After selecting your financial institution from the drop down list, click on 'Go' to launch their website. Tip: To report for another period, select Report premium from the Tools menu, and repeat the same steps. How can I view my report history? On the tools menu, select reporting history. A history of premiums that were not submitted through ePremium (e.g. by mail, email, fax, telephone) will appear, as well as any changes made to premiums that were originally made through ePremium. If you select a specific submission, the details of the submission appear. If the payment for this submission is outstanding, you can select your financial institution to be directed to your bank’s website. If you have an online banking account, you can make a payment online. How do I review my online submission history? Only the premiums that were submitted through this site appear in the history. If you select a specific submission, the detail of the submission appears. If the payment for this submission is outstanding, select your financial institution. The website for the selected bank appears. If you have an online banking account, you can make a payment online. See more on calculating your premiums. 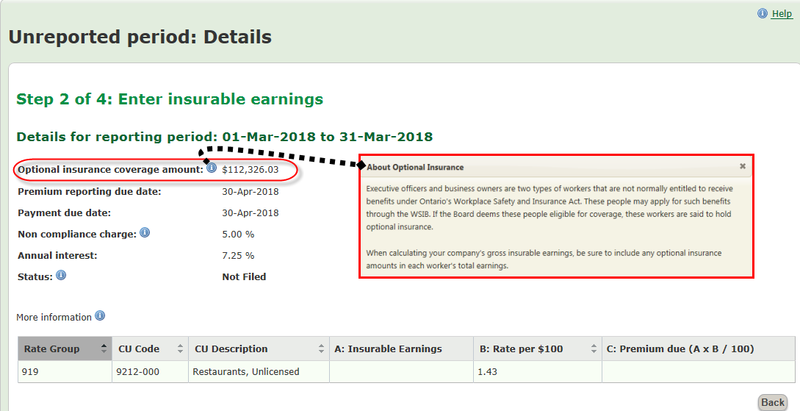 How do I determine insurable earnings? See calculating your premiums for step by step instructions. 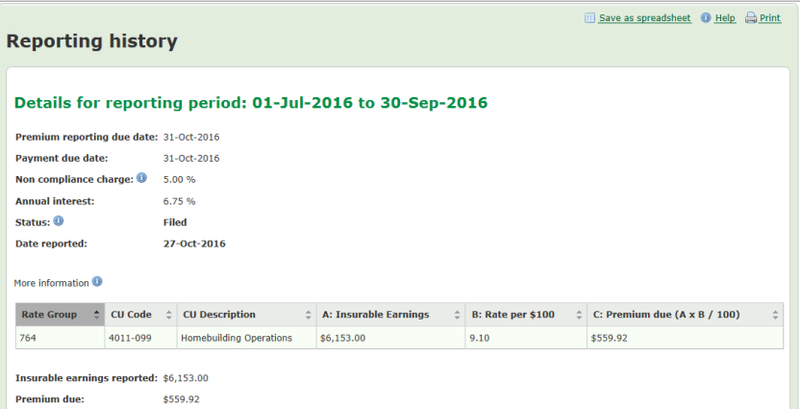 What part of my payroll do I include in my insurable earnings? Total all insurable gross earnings. The maximum assessable earnings amount to include for each person you are responsible for insuring is $90,300 for premiums in 2018. For a complete list of earnings to include, see Appendix I of our determining insurable earnings policy. If you have a business in the construction industry, see Mandatory Coverage in the Construction Industry for more details about insurable gross earnings. What is this year’s annual maximum insurable earnings? 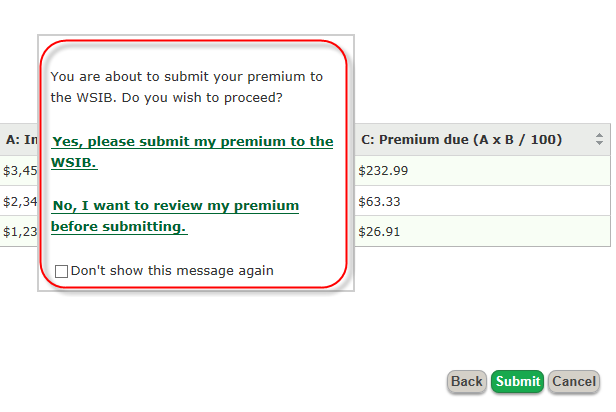 See the "annual maximum" on the Calculating your premiums page. How often do I report and pay? See reporting and payment frequency for details. When is my payment reflected on my account? In general, please allow at least 3 - 5 banking business days for your payment to reach us. Bring your cheque to your financial institution, WSIB office, or mail to WSIB, PO Box 4115, Station A, Toronto ON M5W 2V3. Please remember: if you pay by mail or at your financial institution, you still need to report using ePremium or by sending your stub to the WSIB before the due date. Many institutions have changed their policies and will no longer send the remittance stub on your behalf. How can I pay with my debit card (at WSIB offices only)? What happens when I use the eServices payment feature? If you are logged into your eServices account and select the ‘Pay now’ button, all of your payment information: account number, firm number and current amount due is automatically transferred to Paymentus. The only information you need to provide is your payment type. You can also set up a payment profile, so that when you log into eServices your MasterCard or Visa information is automatically loaded as well. What happens when I use the one-time payment feature? You can also make one-time payment directly to our secure payment partner, Paymentus (not using ePayment). You will need to supply all of your payment information: account number, firm number and payment type. Which banks accept debit using Interac Online? Find a list of financial institutions that currently offer Interac Online debit services on Interac’s website. You can also visit the link above for more information on Interac Online debit. Does Interac Online charge a service fee? No, Interac Online does not charge a service fee and offers a real-time update to eClearance. What information do I need if I want to pay by debit using Interac Online? How do I sign up for online banking and pay the WSIB online? Register for online banking with your financial institution and include the WSIB as a payee on your account (WSIB is normally listed as Workplace Safety and Insurance Board of Ontario - Schedule 1 or WSIB Ontario Schedule 1). If you have difficulty, please contact your financial institution. You will need your 7-digit WSIB account number to enroll. How do I find the WSIB on the payee list? Most bank web sites list us as the Workplace Safety and Insurance Board of Ontario - Schedule 1 or WSIB Ontario Sched 1. Ensure that the title selected contains the word Schedule 1 and Ontario or Ont, as there may be similar organizations listed for other provinces. Please note: When setting the WSIB as a bill payee, you will be required to choose either Schedule 1 or Schedule 2 as an option. Most businesses are Schedule 1. See Schedule 2 for more information. 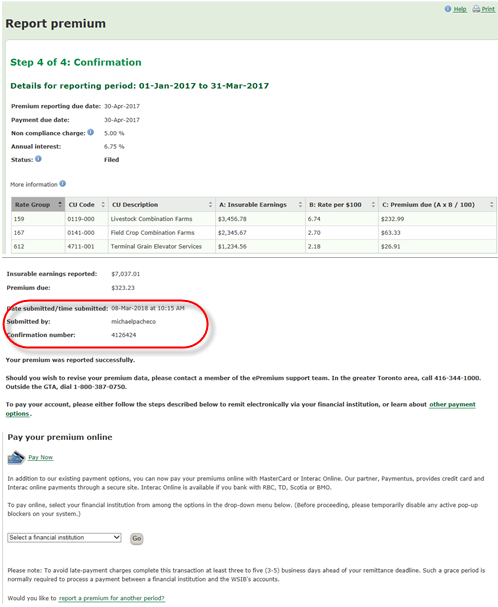 Why would the WSIB make changes to my account? For details on how we handle these premium adjustments, read the full policy on Employer Premium Adjustments (14-02-06). Contact us for further questions. I have an outstanding balance on my account. How do I get a clearance certificate? If the only item on your account preventing you from getting a clearance is an outstanding balance and you pay your balance online or use the automated telephone system, you can get a clearance certificate immediately. ePayment is integrated with eClearance so that any payments made are reflected in real time with eClearance. This allows you to come into compliance and get a clearance right away. Please note that your payment will not be reflected on your WSIB account for 24-48 hours depending on when your payment was made. If you made a payment on a weekend or holiday, the 24-48 hour period begins on the next business day. What credit cards types are accepted? No, at this time, we only accept payment by Visa and MasterCard. Can I use Visa or MasterCard debit? Does Visa Debit or MasterCard Debit charge a service fee? Yes. A fee of 1.75 per cent is applied to each payment amount. For example, if you make a $100 payment to the WSIB with your MasterCard or Visa, your service fee to Paymentus is $1.75. How can I pay by MasterCard or Visa, or MasterCard or Visa debit card? You can pay online or over the phone (416.344.1000, or 1.800.387.0750) through our bill payment partner, Paymentus. Does the WSIB accept MasterCard or Visa payments over the phone? Yes, the WSIB offers an automated telephone MasterCard or Visa payment system through our partner, Paymentus. We are unable to accept MasterCard or Visa payments manually over the phone. To make a payment to one account by MasterCard or Visa call 416-344-1000 or 1-800-387-0750. Follow the prompts on their automated telephone system using the telephone key pad. When does the WSIB receive my MasterCard or Visa payment? Your payment is applied to your WSIB account within 24-48 hours depending on when your payment was made. If you made a payment on a weekend or holiday, the 24-48 hour period begins on the next business day. How is my MasterCard or Visa payment confirmed? For each payment made, you will receive a confirmation number. If you pay online, you will also receive an email confirmation. Your payment is applied to your WSIB account within 24-48 hours depending on when your payment was made. You can see the change to your WSIB account if you log into your eServices account. It is a charge in addition to the original transaction amount for using your MasterCard or Visa. The WSIB does not receive any portion of the service fee. Paymentus is an independent company providing a service for us and is passing along their costs through a service fee. Why is a service fee required? Credit card companies charge businesses like the WSIB a percentage of the payment for processing a credit card payment. The WSIB does not include the processing fee in our customers’ premiums. To be fair to all customers, only those customers who choose to pay by MasterCard or Visa have to pay the service fee. The service fee goes to our bill payment partner, Paymentus. No portion of this service fee goes to the WSIB. How much will I be paying in service fees? The service fee amount depends on what amount you are charging to your Visa or MasterCard credit card, or Visa Debit and Debit MasterCard. A fee of 1.75 per cent is applied to each payment amount. For example, if you make a $100 payment to the WSIB with your MasterCard or Visa, your service fee to Paymentus is $1.75. How does the service fee appear on my MasterCard or Visa statement? Your MasterCard or Visa statement will show the amount paid to the WSIB and your service fee will be listed separately as a payment to Paymentus Corporation. What if I want to pay a different amount from the amount showing on the Paymentus Screen? Proceed to the next screen, you will be able to edit the amount you are paying, similar to what would occur if you were paying your credit card bill.